It displays Days, Hours, and Minutes. It's great for timing long time periods and event countdowns! Our CK-6 LED Digital Day Counting Timer provides reliable, accurate, and easy to read long term time keeping features. Operation is simple and straight forward. The CK-6 can be used as a day countdown timer to display time remaining; or it can be used as a count up clock to display elapsed time. Its unique six digit LED display accurately keeps track of DAYS, HOURS, and MINUTES. The CK-6 is the perfect choice for your long term timing applications. 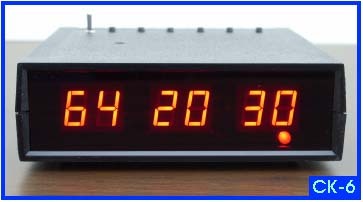 Highly readable six digit red LED display shows Days, Hours, and Minutes. Great for timing any long duration event. An LED next to the minutes display flashes every second to indicate the clock is active and running. LED Size: 0.56 inches - easily readable and sufficiently bright. No more squinting! Maximum Display Time: 99 Days, 23 Hours, and 59 Minutes ( 99:23:59 ). Past this time, the display automatically rolls over to 00:00:00 and continues counting. Count Down Mode displays time remaining - essential for many long term timing applications. Count Up Mode displays elapsed time. Buttons located on the case top for setting Days, Hours, and Minutes; Stop-Start, Reset, and Clear. Simple & Easy to Use! Battery back up keeps accurate time during power interruptions. Never miss a second! Alarm: Beeps and flashes for one minute. After one minute, the display flashes until the reset button is pressed. Simple Operation! The CK-6 Digital Day Counter Timer offers simple & straight forward operation. The CK-6 Digital Day Timer is easy to use and fully settable. It will Count-Up to or Count-Down from any time that is entered using the DAYS, HOURS, and MINUTES buttons. It can also count up freely from 00:00:00 with no preset limit and alarm function. SIMPLE TO USE! To see the CK-6 one page instruction sheet, click here. "64 DAYS - 20 HOURS - 30 MINUTES"
The LED light below the minute digits flashes each second to indicate the timer is active. The CK-6 offers the very unique capability of displaying Minutes, Hours, and DAYS. This feature makes the CK-6 ideal for use in timing long term events and activities. The CK-6 is perfect for use in motivating business sales, goal setting, membership drives, Science & Engineering Laboratory activities, and much more! For long duration timing, the CK-6 Day Counter Clock is the solution. Time Job & Project Activities - Set a goal to achieve! Monitor progress towards an important goal - FANTASTIC! And much more! Do you have ideas? Let us know! Functions as a Day Countdown Timer or Day Count Up Timer! We proudly stand by all our products, and your satisfaction is fully guaranteed. 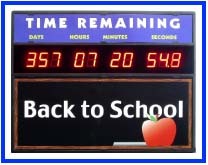 Looking for a large wall countdown clock? Then check out the unique CK-5000. If you're looking for the large version of the CK-6: CK-6000 Day Count Up / Countdown Timer. CK-1 Digital Desk Clock : 0.56 Inch LED display. 12 or 24 hour clock formats. CK-1000 LED Large Digital Wall Clock : Large six digit 2.3 Inch LED display. 12 or 24 hour clock formats. CK-2 Time Zone Clock : 0.560 Inch dual LED display, six digits. 12 or 24 hour clock formats. CK-26 Time Zone Desk Clock : Dual display desk clock for UTC and local time. CK-3 Digital Desk Count Up and Countdown Timer : 0.56 Inch LED display, Six Digits. CK-3000 Large Digital Timer : 2.3 Inch LED Display, Six Digits. CK-350 Digital Large Count Up Timer : 2.3 Inch LED display, Six Digits. CK-4000 Large Digital Stopwatch Timer : 2.3 Inch display: Minutes, Seconds, & Hundredths of Seconds. CK-36 Elapsed Time Clock : 0.56 inch LED display - simple count up timer with two button operation. CK-46 Stopwatch Lab Timer : 0.56 inch LED display - functions like a basic stopwatch, with hundredths of seconds.